Posted on Mar 30, 2015 by Appleton Downtown Inc.
Creative placemaking generally refers to efforts to shape the built environment in ways that engage users. It is collaborative, inclusive, and focused on bringing people together and bringing them back again. Much of creative placemaking focuses on adding and integrating art into shared spaces. Murals and sculptures are part of this, but it can also include the design of a bench or the colors of a crosswalk. Thinking creatively about how a plaza or bridge are designed can turn what was a simple space into a destination place. 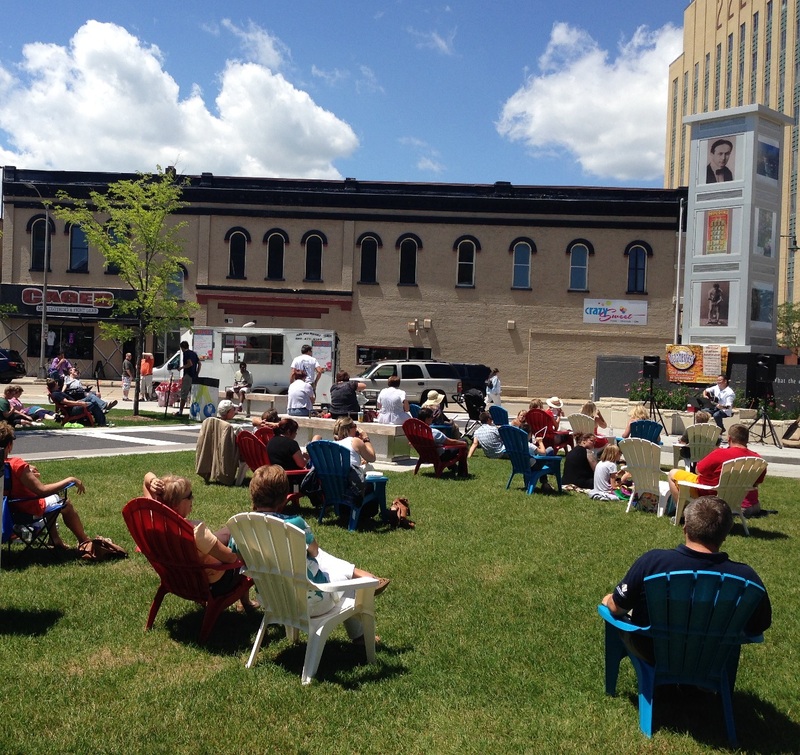 In our own community, Houdini Plaza offers an example of creative placemaking in practice. Prior to renovation, the plaza had some grass, a sculpture, and pavers, but not much else. Things happened there, but rarely was it a destination itself. Through vision and investment of resources, the City of Appleton turned the plaza into a place people want to use. A water feature, trees, seating, and a stage all give the space a new usefulness that draws visitors. It is a great concert venue and also a nice spot to relax in the sunshine. After the renovations were complete, the thoughtful addition of some colorful chairs made the place even more engaging. These seats can be moved and rearranged so people can make the space what they want it to be. This interactive element encourages users to linger a little longer. But great places are so much more than cool benches and interesting art. Spontaneous events (like the “pop up dinner” that has happened in Houdini Plaza) and live music give people another reason to stop and stay awhile. Well-designed places can also tie distinct areas together, meaning people can park and easily walk from one area to the next. Creative placemaking doesn’t have to be expensive or cost any money at all! Events like “Art on the Town” bring creative elements to downtown, and help to boost economic activity for the artists who participate and the businesses that host them. Creative placemaking offers the Fox Cities an affordable way to involve the many artistic people who call the area home. The vibrant energy that creative placemaking adds helps distinguish the Fox Cities from other similar communities in the Midwest, which helps attract and retain workers who will then attract and retain businesses. And it makes the spaces we share more fun! If you have ideas for how to make your city a more creative and attractive place, share them with the Creative Placemaking Team at Appleton Downtown Inc. We want to help you make them a reality!